What makes a violin sound good? Is it truly just the violinist that is required to make beautiful melodies on a beginner violin, or do you need a high quality violin in order to sound good? Well, the answer can be both, and it can be neither. You can have the worlds most experienced hands on a violin and the result could be something beautiful, or it could sound horrible no matter what they try. The same can be said for the worlds top Stradivarius or Guarneri violins, which are the bet violins in the world. If placed in the hands of a beginner, no-one would know that they are indeed such high quality violins. So what makes a violin good? And which violin should a beginner look at getting? Well, there are a few components that we should mention before we share a list of the best violins for beginners, as well as the best violins for advanced students. By knowing what to look for, it can help anyone looking for the best violin for beginners. Read on to see what to know when browsing through someone’s rack of “quality violins to sell”, and you’ll be able to notice which of those are actual quality violins, and which are not. 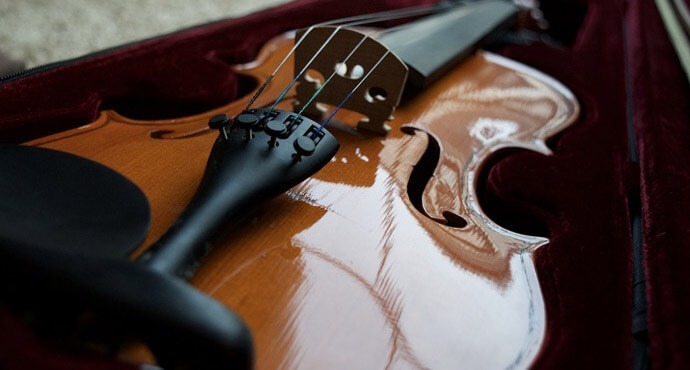 The body of the violin itself is very important, whether you’re a beginner violinist, intermediate violinist, or professional, you can’t risk having a low-quality violin. However as violins can be frightfully expensive, many people choose to go the secondhand route, and so there are few things to look out for, and avoid (in some cases). The first (and most important) part of the violin to look at is the body. Generally a violin should have a top and bottom made of spruce wood, and the sides made of maple. Yes, to tell the wood apart would take great skill, so why are we telling you this? Many people think that buying a plastic violin, or one made from laminated wood is acceptable. Never, never, never buy a plastic violin! Just take this advice, and run far away. When looking at the violin body, also keep an eye out for cracks in the wood, as cracks can lead to splitting of the wood, and with the immense pressure from the strings, you really don’t want splinters of wood being shot off at great speeds. Why do we say the wood is so critical? Well, it’s not so much the wood, but the varnishing that you’re looking at. In a professional violin, the varnish is even (and worn in some places), the grain is fine, and the brush strokes are even. This all gives the violin a soft, warm, reverberating tone when played by a professional violinist. With any beginner or intermediate violin, you should have a look at the varnishing to see how smooth it is, as well as how thin it is. The thicker the violin, the less the notes resonate within the body, and the duller the tone will be. Ideally, you’re wanting a violin with a thin, but present coat of varnish, so that the body is still protected, but the tone comes through. It’s a common mistake for most people when they buy a beginner or student violin to miss the varnish, and that will affect the tone more than anything else. Many people forget that the bow is also a part of a violin. True, violin bows can be used on any violin, and they’re a lot easier to find and replace than a whole violin, but when buying a used (or new) violin, often it’s easiest to use the bow that comes with the violin. With beginner violins, so long as the bow has enough rosin, it means that sound will come out when dragged across the strings. Have a look at wear and tear on the bow, to see how the previous owner played the violin. If it’s incredibly worn out, it means the violinist was playing their violin hard, and you should analyze the violin carefully for stress cracks and fractures before buying. Yet another overlooked component of the violin is the strings. Many beginner violinists forget that strings wear out too, and only replace the ones that snap. However violin strings are so important, that there should be an article explaining just how important good quality violin strings are. When getting a violin, find out whether the strings were the “stock strings”, or when they were replaced. Generally strings from an intermediate violin should be replaced every 6 months at most. For a beginner violin, the strings can be older. For professional violins, every 3 months. You should look at replacing the strings in a secondhand violin if they look grimy and dirty, if the violin strings can’t hold a pitch, or if the tone sounds dull (be careful that it’s not the varnish here though). Brands such as D’addario and Cecilio are amongst some of the top string manufacturers. The last thing that you should be looking at when looking for the best violin to buy is the feel. It doesn’t help to spend thousands of dollars on an expensive violin, to discovered that it feels horrible and uncomfortable to play. A violin should feel like an extension of your arms, shoulder, and hands. You should feel comfortable when playing it, and it should feel natural. If it doesn’t, then either you need to change your technique, or change your violin. This isn’t so much a scientific method, as it is a “feeling”. You’ll know if a violin feels right or not when you hold it. Now that you know what is needed when choosing a secondhand violin, it’s time to look at a few reviews and analysis’ of violins, for any beginner, intermediate, or advanced violin player. Naturally, most of these will be geared towards beginners, but some will have the potential for greatness, and so we will tell you which violins can work for both beginners and advanced students. These aren’t ordered in a “1-15” method, as the calling something the “best” is subjective to your tastes, as opposed to someone else’s tastes. When it comes to violin models, you shouldn’t really concern yourself though. The real thing you need to look at is who made the violin. As every violin has to be handmade, it means that you’re really looking for the best violins makers, as they will make the best violins (this is only natural). With that in mind, here are the top 15 violin makers, in no particular order. 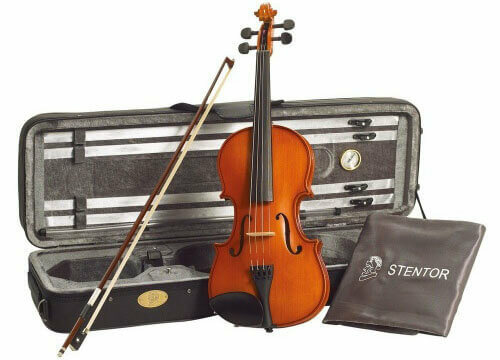 Stentor is a chinese-made brand of violin that is affordable, but not too cheap. The violins are usually made out of good quality components (such as the fingerboard, chin rest, tuning pegs etc), which makes it the perfect student violin. A very commonly bought model of theirs is the Conservatoire II Student Violin. This violin has a solid maple back, and a spruce front, which is carved elegantly. The fingerboard, tuning pegs, and the frog on the bow are all made from ebony, which adds to the beauty of this instrument. The body itself is varnished with shellac, which adds a amber color to the instrument, as well as giving it a nice warm, natural sound. 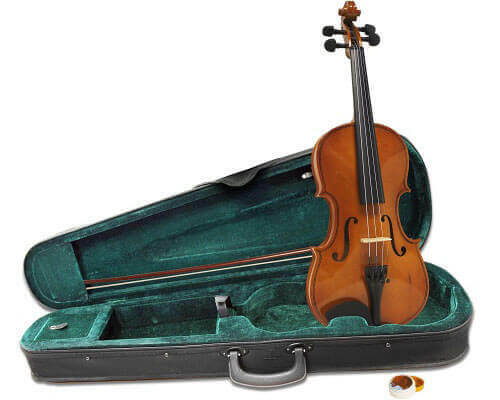 Overall, if you get this violin as your starter violin, you will be able to use it all the way till you become an advanced violinist. Although slightly out of the price range for beginner violinists, it has been called the best violin under 500 dollars by many violinists. The sound is good enough to be classified as a intermediate violin, although even some advanced violinists state that it’s good enough for them. It offers great value for money, when you weigh up the pros vs the cons. Windsor violins are some of the best budget violins, as they’re affordable, but still have good enough tone for beginner and intermediate violinists. One of the most popular violins of theirs for beginners the the Full Size 4/4 Student Violin. The Windsor student violin has a spruce top, and an ebony fingerboard. It has a varnished finish, and usually comes with a sturdy violin case and a wooden bow. The other added benefit to using this violin as a beginner’s violin, is that it comes with fine-tuning pegs that are beneficial for pitch training when a student needs to tune their violin. If you’re looking for a budget violin, then this one is the perfect beginner’s violin. 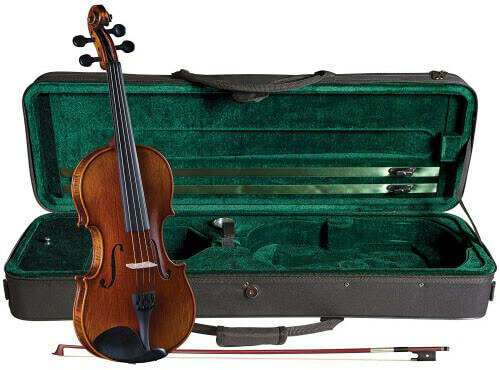 With a case and bow provided, it’s perfect for someone looking to break into the violin world. And easily available for around $50, it’s one of the best violins for high school students. Due to the affordability, is is often called the best violin to start on. Primavera are renowned for their violins, both for their student level, and intermediate level violins. Why are they so popular? A simple reason, good quality violins. The level of quality that goes into these violins makes them popular amongst many students and instructors alike. A good choice for a beginner’s violin, this instrument has won awards as the best stringed instrument in the UK 3 years in a row, so it often comes up when people ask what the best violin to buy is. With a satin varnish, and added durability, it’s no wonder that it’s popular amongst violin students and violin teachers alike. It boasts ebony fittings as well, just as an added bonus to any violinist wanting a level of quality from their violin. If you’re looking for the best violin brands for beginners, then Primavera is definitely for you. This violin has enough quality and popularity to win awards, whilst still being affordable enough for any beginner or intermediate violin student. Next on our list is Mendini violins. These are some of the best budget violins, as Mendini manufactures their violins in a factory, which means that the are incredibly affordable, whilst still being decent enough in tone and finish to make a beginner violin student proud to own it. The Mendini MV200 Solid Wood Violin boasts a spruce top, and maple sides and a maple back as well. The natural varnish color provides a warm tone for any violinist, with ebony finishings to top it all off. Each kit comes with a shoulder rest, rosin, and a high-quality mongolian-horsehair bow. Versatile kit, with rosin, shoulder and chin rests, box, and case. It might not be the most expensive violin brand, but Medini violins are affordable, and receive positive violin reviews from students and teachers. Coming in between $60-$80, it’s definitely one of the best violins for beginners, as it comes with everything a new violinist will need, as well as having good enough tone to get you through your lessons pleasantly. One of the best violin brands for intermediate players and beginners alike, the Cecilio violins have to be on this list, in fact we would be remiss if we didn’t add them. Each Cecilio violin is hand-carved, and treated with hand-rubbed oil finishes. One might even add them to the list of professional violin brands. Hand-carved maple back, with a solid top made from spruce, the CVN-500 Violin is a top choice as an intermediate-level violin, as well as being one of the best sounding beginner violins out there. Each violin is string with D’Addario strings, and only the top quality components are used when these violins are made. To top it all off, there are gold-plated fine tuners attached to the tailpiece of the violin. If you’re wanting the best beginner violin that will take you to the outskirts of advanced violin playing, then a Cecilio violin is definitely the way to go for you. The price is worth it when you consider the level of quality violin you’ll be getting. Some of the best chinese violins, Cremona are on this list due to the exceptional ration of affordability to quality that is provided by the violin making company. The violins made by this company are nothing short of exceptional, and because of that, they have been called by some “the best intermediate violins” on the market. One of their models, the SV-500 to be exact, doubles as one of the best beginner violins, for a beginner who knows they’re going to be advancing through the levels rapidly. These hand crafted violins come with a transparent varnish on the spruce and maple bodies, along with ebony fingerboards, and D’Addario strings fitted once completed. Although not a Stradivarius (one of the top violin makers of the world), they do sport the identical chinrest, for violinists that want that professional feel, without having to pay thousands of dollars. Overall, there’s nothing wrong with this violin for beginners, apart from the higher-than-average cost that comes with it. The tone and feel is good, the color is warm and inviting, and all the violin reviews give glowing reports on how well the violin does in the hands of a professional violinist. A very popular violin brand in America, the Franz Hoffman violins are endorsed by SHAR music, and are extremely popular as a good beginner, intermediate, and advanced violin. As SHAR music also endorse some of the best contemporary violin makers in the US, you can trust them when they say that this violin maker meets their approval as one of the good violin brands in their line of endorsements. One of the more popular violins of theirs is the Maestro Violin. This violin is favored by violin instructors for it’s warm tone, and ample audio projection. Made using a spruce top, and a solid maple body, this violin has a lovely varnish finish. Also to be noted, is that the violin tailpiece comes with finetuners, as well as an ebony chinrest and fingerboard. Usually this violin comes as a package deal too, with rosin, Overture Ultra strings, and a Schmidt violin bow. Just like the Cremona violins, this violin brand is good for intermediate players, or for beginner violinists that want to progress to a higher level of playing, whilst still sounding like their violin is one of the most expensive violin brand (namely Stradivarius). If you can afford the budget, then this violin is the way to go for you. Another violin brand endorsed by SHAR music, the Carlo Lamberti violins is among some of the best contemporary violin brands on the market today. Although the price might put a lot of budding beginner violinists off, the quality of these violins is breathtaking, as you will see in the violin review of the Carlo Lamberti LV11 Sonata Violin. This hand-crafted violin features everything that any violinist wants from a quality violin. It has a rich and enjoyable tone which is a nice change from the scratch, tinny tones of cheap violin brands to avoid. It comes in various sizes, and all the fittings are of the highest quality. Although not one of the violins under 500 dollars, it still should be featured on this list, because it’s not one of the most expensive violin brands either. Comes with sturdy Toshira case, rosin, and Meinel Pernambuco Bow. As stated earlier, this is a high quality violin. One might even call it a professional violin, an investment, or a violin for all levels. 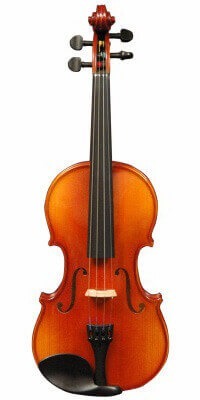 If you get this violin, then you won’t need to keep upgrading your instruments as you grow tired of the tinny sounds, as this one will provide your (and your neighbours’) ears with a pleasant, warm, rich tone one you progress past the beginner levels onto intermediate, and then advanced violin playing. Considered to be one of the best contemporary violin makers, Scot Shu-Hun Cao creates top-quality violins based on the designs of master violin makers, such as Guaneri and Stradivarius, his violins are praised by students, teachers, and professional violinists alike. Although we can’t really classify this violin as one of the “best beginner violins” (due to the cost), we can say that if you got a Scott Car violin, such as the 1714 Soil STV 850 violin, it’s one that you would be able to use for the rest of your life. The STV 850 is an exceptional quality instrument. Based on a Stradivarius violin played by Itzhak Perlman, the look and feel makes it one of the best professional violins at an affordable (for it’s quality) price. Because of the care that goes into the design, there is excellent tone for both the high registers, as well as the low registers. It’s got a two-piece back, with a nice balance for easy playing. As stated earlier, not really a good beginner violin due to the cost. However, if you can afford it, and you buy this as a beginner’s violin, then it will quite possible be the best violin that you could get, as the quality will scale with skill, which means in the long run, you’ll be saving as you won’t need to buy a replacement violin for many years to come. This violin manufacturer is a confusing one, as some say that it’s a German company, whereas other’s say it’s America. So which one is it? Well, it is true that Knilling is one of the german violin brands, as it originated in Germany, but for the past 90 years, that have been making their violins in America, so the answer is both. But going back to the violin reviews, how do their violins compare to the rest? Most violin teachers know of Knilling, and some have probably played on their violins. One of their most popular violins is the Knilling School Violin Outfit, and for good reason. This violin has a solid maple back, as well as a maple bridge. The chinrest is based on the ones used for Guarneri violins, and with the inlaid purfling and solid carving, it’s no wonder why it’s popular. The finishing is also praised, as it’s done with an even grained spruce top, which adds to the smooth and professional look. Overall the tone is good, warm, and pleasing to the ear. As an intermediate violin, it’s very popular, and a good choice. Once you reach the higher ends of advanced violin playing however, the tone won’t be as pleasant and clear as you would be expecting at that level. However, if you’re starting out from scratch, then this is definitely a choice for a good starter violin. One of the biggest names in musical instruments, Yamaha makes everything from pianos, to keyboards, guitars, drums, and of course violins. Why are Yamaha so famous when it comes to violins though? It’s because they create different types of violin. Yes, everyone knows about acoustic violins, and after reading this article you’ll have a good idea on which violins are the best acoustic violin brands. However Yamaha not only make good quality acoustic violins, but also best quality electric violins. Because of the diversity, we had to include two of their violin types in this violin review (their acoustic “Model 5” violin, and the “SV-130” electric violin). 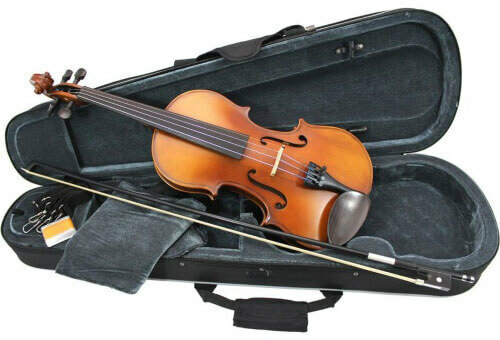 The Model 5 violin from Yamaha is popular universally amongst violin teachers, all the way from America to South Africa. It is durable, versatile, and has a high resell value. The top is made from spruce, naturally. The back is made from carved maple, and the sides are made from entire maple sheets, which means that the violin is able to take a few bumps without worry (not that you should be bumping your violin around mind you). It also usually comes with a bow and rosin, as well as fine tuning pegs for the student to use in their ear training. As far as the world is concerned, if you have a Yamaha violin, then you’re a good violinist who knows what they’re playing, and how to play. Yamaha violins are good investments for those who want to go far with their playing, and with a high resell value, it means you can upgrade to a better model fairly easily, without losing too much money. These violins are versatile, and easy to play. Definitely one of the top violin brands. When it comes to violins, the world is divided between loving, and hating electric violins. Some of the older generation state that a violin is either acoustic, or not a violin. Whereas a lot of the good contemporary violin players say that it’s the way of the future. Either way, the the SV-130 “silent” violin is one of the best contemporary violins on the market. Why silent? Because there’s no body, it means that when played, on the violinist themselves can hear the notes being played, unless they plug the violin into an amplifier. If you’re looking at becoming a contemporary violinist, or you’re wanting to record your violin playing, then this violin is for you. Electric violins are fast being added to the lists of fiddle brands for bands, as the versatility that can be achieved through electronics means that distortion, overdrive, tone, warmth, and sound adjustments can be added on the fly. The price is a little high to be considered a good beginner’s violin ordinarily. However, if you’re an electric guitarist then this would be an excellent choice for you, as electric guitarists are used to playing through amps and hearing soft tones from strings as it is. Klaus Mueller, sounds like a good german violin brand, yes? Well don’t let the name fool you. These violins are actually made in China, but don’t let that dissuade you from their quality level. They offer great quality for their price, and then extra just for good measure. These violins are hand crafted, and the quality of the wood used can put a lot of American violin makers to shame. One of their popular models is the Bucharest Violin Outfit. The Bucharest Violin is made from european-sources woods (spruce and maple), and features an ebony fingerboard and tuning pegs to boot. It’s designed after European violins, which means that the feel is quite comfortable for anyone who’s used to the more well known European violin brands. The violin itself produces a warm tone, and incredible clarity. It’s a good intermediate violin, due to the price. This has to be one of the best value for money violins around. With the price range around $300, it means that a lot of eager violinists can afford it, and the quality will carry them through the levels all the way to advanced, where they can upgrade to a better violin. The tone and sound is good, and this model receives high praise in violin reviews online. If you see a video of a violin student online sporting a brightly colored violin, such as blue or pink, then chances are you’re seeing a Merano violin. Established in the year 2000, Merano have become quite popular in violinist circles as a good beginner violin, due to the incredible affordability that they offer. If you’re looking for something to try your hand with violin, then the Merano MV10 4/4 Acoustic Student Violin is probably a good choice for you. As one of the most affordable violins in the violin review (between $50-$60), it’s not wonder that they’re popping up everywhere. These are probably one of the best student violin brands, as students don’t have enough cash to spend on a $300 violin, and the funky colors are an added bonus. Surprisingly, the tone and feel isn’t lessened as much as you’d expect from such a cheap violin. Merano post that they wouldn’t sell an instrument that they wouldn’t play themselves, which means the carved spruce top, maple back, and hardwood fingerboard and pegs are all high quality. Usually comes with case, rosin, and horsehair violin bow. Tone suitable for beginner violinists, but falls to the wayside after intermediate levels. If you’re looking for a good cheap beginner violin, then this is probably the best violin on the market, as it’s one of the most affordable ones out there ($50-$60 remember? ), with decent tone. Merano is definitely not one of the violin brands to avoid due to price though, as there are enough quality checks in place to make sure that you get the most out of your playing. The last violin brand on our list is Kinglos. They are a contemporary violin maker, focussed on creating attractive and beautiful violins, in exchange for losing some of the sound quality in the process. They are a chinese violin and guitar company, founded in 2009 (not long before Merano in fact). They have so many violins to choose from, that we couldn’t list them all here. However, we can give an overall review on the company violins. Kinglos produce painted violins, and engraved violins. The painted violins are decorated with floral designs, custom designs, and other beautiful painted-on drawings that are attractive to any modern music student out there. The tone does suffer slightly, but overall the tone is still good enough for these violins to be considered acceptable beginner student violins. Alternatively, they offer engraved violins, with floral designs engraved into the body itself. The quality of the body is such that it won’t break under the pressure of the violin strings, but the tone itself will suffer somewhat. Not suitable for anyone wanting quality sound from their violin, as the paint will muffle the sound, and engravings tend to add a rough tone to the violin. If you’re wanting a fun-looking violin, or something affordable that will make you as a beginner violinist stand out, then a Kinglos violin is for you. With the diverse and attractive designs, it’s popular amongst performers and students alike. So then, after going through this entire list, which violin is the best violin? Well, that answer is a subjective one, depending partially on violin reviews, and mainly and on budget and personal preference. It’s a generally accepted fact that one of the violin brands to avoid is All Days Music (ADM) violins, as many violin teachers view this brand as a maker of VSO’s (Violin Shaped Objects), rather than quality beginner violins. The best way to choose a good beginner violin would be to start by reading online reviews (just like you have in this article). Next, get a figure in your head about where your budget is. Thirdly, work out what skill level you’re on currently, and where you want to end up (and in what time frame). Once you have those three points covered, then the process of choosing the best beginner violin can start. After going through the reviews of the violins in your budget range, put together a list of your top choices, it’s time to go to the next stage, namely the testing stage. Go to music shops that stock the violins you’re interested in, and play each one in turn. See which one feels the most comfortable for your shoulder and chin, as well as which one has a comfortable bow action. Once you’ve played the violins, you’ll be able to tell right away which one you want. Playing the violin should be an enjoyable hobby, and if you’re not enjoying it, then you need to find a violin that you enjoy playing. 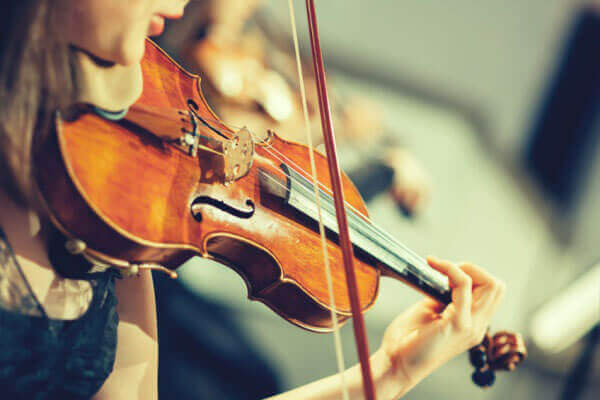 Many professional violists and fiddle players will often choose a middle-of-the-range violin, not because of price, but because they like how it feels. If you find a violin that feels good to you, you should go for that one.